oomph. : [oomph] eats. a first for the last. 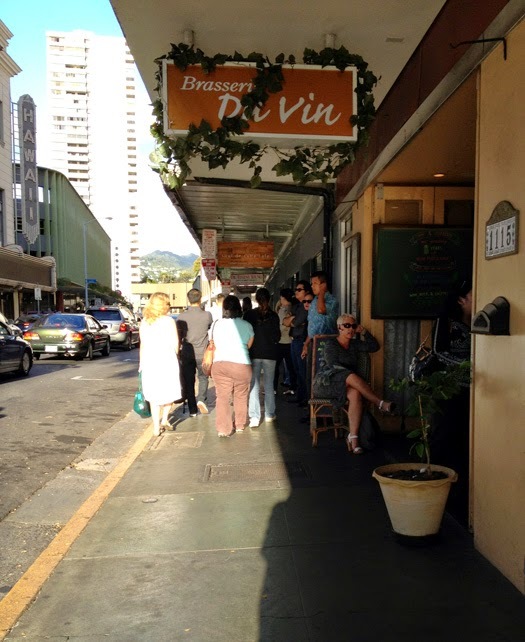 brasserie du vin was my go-to place for drinks downtown. it was right across hawaii theater, and we'd always start or end our night there after a show. other times i'd meet up with friends there just because of the cool european vibe of their little outdoor patio. of course, it was super crowded as everyone was trying to have their final drinks and bid that little slice of europe goodbye. a bunch of us had to squeeze around a tiny table, but it was worth getting to sit in the cobbled alleyway outside. 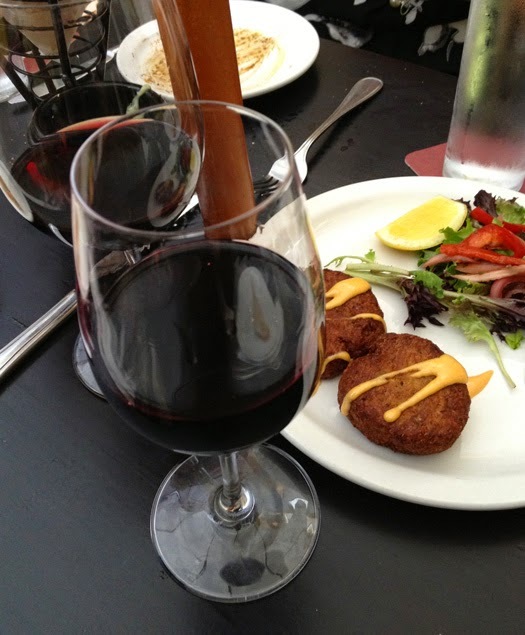 they were known for their wide selection of wines and accompanying cheese platters among other yummy things. they sold out of their delicious baked brie, so we filled up on pommes frites, pan-seared scallops, and crab cakes. and while i never had a chance to try one of their cheese or charcuterie platters, i did experience something new that night...escargot. with visuals of huge african snails in our garden and crawling all over our fence, the thought of eating snails never appealed to me. blech. but i figured, what the heck. it was a great first for the last night. what's something you hesitated trying? escargot is a nigerian delicacy i love eating it!! but its so expensive!! it seems so gross but we clean all the slime before cooking it so its never slimy tasting. I've had it cooked in an italian restaurant and i didnt like it though lol i prefer the nigerian way! I hate when a favorite hangout suddenly closes. So sad. At least you got to have one last visit. I have never tried escargot and don't plan on it! But I am glad you enjoyed it! I'm glad you got to enjoy a meal there before they closed. Looked like a great place. I have to admit I never tried it - honestly I heard about it the first time in my life :) It's always a pity to say good bye, especially if this is a place where we loved to be. Hopefully you have some replacement! Hate that your fave spot is closing! And no to the escargots. Just because. Ew.